NEW! Try Hahnemuhle Photo Rag METALLIC Photo Paper- NOW AVAILABLE! Our "Gallery Framing Packages" have become THE popular choice and easy solution for clients participating in group exhibitions and/or for basic resale. CLICK ON THE IMAGE AT VERY BOTTOM OF PAGE TO VIEW SELECTIONS. 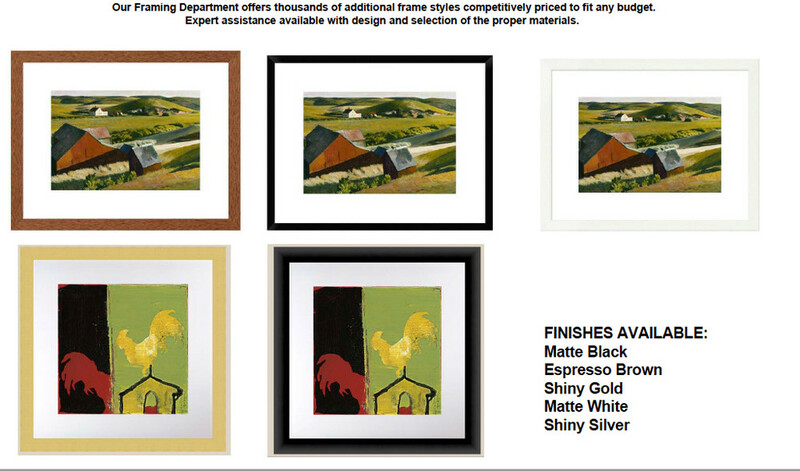 PRICE INCLUDES: Premium Clear Glass, 4 PLY Archival White Mat, Acid-Free Foam-core Backing, Labor & READY TO HANG. UPGRADES AVAILABLE (8 ply mat, UV glass, plexiglass, drymount). YOU MUST ORDER PRINTS SEPARATELY. Your prints will be matted to the image, centered or slightly bottom-weighted if possible. Choose frame category and finished size. Indicate frame selection by checking the corresponding letter and number. Guarantee and Returns We offer a 100% satisfaction guarantee*. If you are not completely satisfied, we will gladly exchange, reprint, or issue a full refund, provided the issue is reported to us within 10 days of delivery. Please notify us at info@digitalartsstudio.net and someone will contact you to discuss the issue. *We CANNOT guarantee 100% color accuracy on prints made from your submitted files. If your work is extremely "color-critical", we suggest ordering a proof print, (8.5x11 on your choice of media). A hard copy is the best way to see how your colors will print. We carefully calibrate, test and evaluate all the materials we use; papers, canvas, varnish, matboard, etc. You may notice that we indicate specific brand names in our descriptions so you are assured consistent results when placing future reorders. Breathing Color Chromata LYVE canvas is the best on the market and made in the USA. Hahnemuhle, Canson, Arches and Somerset are all "old world" fine art paper mills that have produced archival, cotton rag fiber papers for centuries. Museo Silver Rag has consistently taken top awards in print quality competitions. Canon Lucia EX pigmented inks have the largest gamut (color range) of re-produceable color. Archival prints on fine art papers or canvas will last for many decades with proper care. © Copyright 2015, Tiny Dots On Paper, Inc. All Rights Reserved. Enter your email for a chance to win GIFT CERTIFICATES to Digital Arts Studio! We hate SPAM and will NOT sell or give away your contact info! We also respect your time and promise not "over send"!